The Income Tax Act has specified the books of accounts that are required to be maintained for the purpose of Income Tax. These have been prescribed under section 44AA and Rule 6F. Who is required to maintain books of account? When is bookkeeping not required? The following professions should maintain accounting records if their gross receipts are more than Rs. 1,50,000 in 3 preceding years for an existing profession. This also applies to a newly set up profession whose gross receipts are expected to be more than Rs. 1,50,000. Authorized representative — A person who represents someone for a fee before a tribunal or any authority constituted under law. It does not include an employee of the person so represented or someone who is carrying on the profession of accountancy. Film artist — This includes a producer, editor, actor, director, music director, art director, dance director, cameraman, singer, lyricist, story writer, screen play or dialogue writer and costume designers. If you are a freelancer pursuing any of these listed professions and your gross receipts are more than Rs. 1,50,000, these rules shall apply to you. If the gross receipts of the Professions listed above are not more than Rs 1,50,000 in any one or more of the preceding 3 years for an existing profession or for a newly set up profession whose gross receipts are expected to be less than Rs 1,50,000 – the professional has to maintain books of accounts. What all books or records should be kept has not been exactly specified. The only condition is the AO should be able to compute the taxable income of the professional from them. From AY 18-19, the limit of Rs. 150,000 has been increased to Rs. 250,000. A record of day to day cash receipts and payments which shows cash balance at the end of the day or at best at the end of the each month and not later. A journal is a log of all day to day transactions. It is a record, in accounting terms, where total credits equal total debits, when we follow the double entry system of accounting ie each debit has a corresponding credit and vice versa. A ledger where all entries flow from the journal, has details of all accounts, this can be used to prepare the financial statements. Following are the additional requirements in case of a person carrying on medical profession — physicians, surgeons, dentists, pathologists, radiologists, etc. These books should be maintained at the Head Office or at each of the offices. For how long should these books be maintained? Each year’s books must be kept for a period of 6 years from the end of that year. If you fail to maintain books of accounts as prescribed, you may be charged a penalty of Rs 25,000 or in some cases where you may have international transactions and you have failed to maintain information and documents for such transactions – 2% of the value of each international transaction. It would be diligent to maintain your books of accounts and keep track of all your expense and income in a methodical way. Where the income does not exceed Rs 1,20,000 or total sales, turnover or gross receipts are not more than 10,00,000 in all preceding 3 years — no books of account are required to be maintained. In case of a newly set up profession or business the same rule applies when income is expected to be less than Rs 1,20,000 or sales/turnover/gross receipts are expected to be less than Rs 10,00,000. Where the income is more than Rs 1,20,000 or total sales, turnover or gross receipts are more than 10,00,000 in all preceding 3 years, such profession or businesses must maintain books of accounts and other documents which may enable the Assessing Officer to calculate their taxable income as per the Income Tax Act. No specific records are prescribed. In case of a newly set up profession or business the same rule applies when income is expected to be more than Rs 1,20,000 or sales/turnover/gross receipts are expected to be more than Rs 10,00,000. Businesses covered under section 44AD and 44AE are not required to maintain any books of accounts. However taxpayers who claim that their income from business is lower than the presumed income calculated under section 44AD and 44AE must maintain books of accounts which may enable the Assessing Officer to calculate their taxable income as per the Income Tax Act. No specific records are prescribed. From AY 18-19, the limit of Rs. 120,000 has been increased to Rs. 250,000 and Rs. 10,00,000 to 25,00,000. A person covered under presumptive income scheme section 44AD If income of the business is lower than the presumptive income calculated as per Section 44AD and the person’s total income is more than the minimum income which is exempt from tax. A person covered under presumptive income scheme section 44AE If income of the business is lower than the presumptive income calculated as per Section 44AE. The deadline for audit and submission of report is November 30 in case of international or specified domestic transactions. If the tax payer fails to maintain accounting records as per the requirements of Section 44AA, a penalty may be levied under section 271A. The maximum penalty that can be charged is Rs. 25,000. However, if the tax payer can prove there is a reasonable cause for failure to maintain accounting records – such penalty may not be levied. 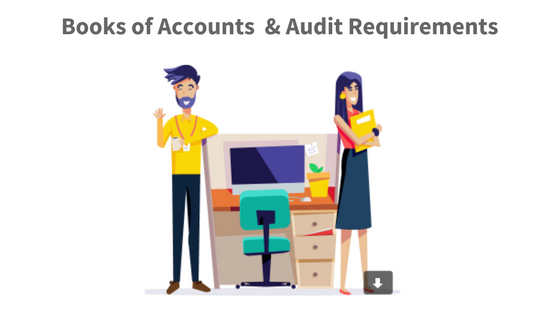 If the tax payer fails to get the accounting records audited or furnish audit report as per the requirements of Section 44AB, a penalty may be levied under section 271B. The minimum penalty that can be charged is 0.5% of the total sales, turnover or gross receipts. The maximum penalty is Rs 1,50,000. However, if the tax payer has a reasonable cause for failure to get an audit done – such penalty may not be levied. Read more about income tax for freelancers.